Here are six critical reasons why you should have a private session or two, or three, as well as the benefits that you are likely to achieve. 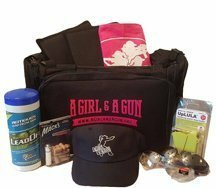 A Girl & A Gun Women’s Shooting League (AG & AG) is proud to launch the all-new 2019 Shooting Journal. Marksmen have long used shooting journals to analyze range performance and log their practice sessions. 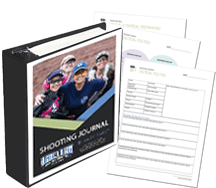 With this Shooting Journal, AG & AG offers a revolutionary program to help the female marksman organize her plans, goals, time, and training. By Sandy Kozero. As I crash into bed after my full day of hiking, my mind still hears the low rumble of the crowd and my thighs burn numb. I am glad that my friend convinced me to attend the NRA Annual Meetings & Exhibits. Next time the NRAAM is within a 5-hour drive of San Antonio, you can bet that I will be there, not for just one day, but for the entire 3-day event. Any time is a great time to invite a friend to the range. Especially if he or she is a nonshooter or antigunner, introducing your friend to gun safety is always rewarding for everyone. Before you take a new shooter to the range, plan using this checklist so that you give her the best experience possible. By Sandra Kozero and Tracy Thronburg. More than half of female homicides are by an intimate partner. Women must have resources and train for the unthinkable. This article lists 10 ways to train against Intimate Partner Violence. Congratulations! You have decided to become your own first responder, what now? The simple answer is that you need to go get trained up. The reality is not so simple; knowing where and how to get good training can be overwhelming, time consuming, and become very costly. The good news is it doesn’t have to be if you have a well-balanced training roadmap. A Girl & A Gun facilitators offer “mini-clinics” that cover the 5 Fundamentals of Accurate Shooting at most Girls’ Night Out (GNO) events. In the interest of safety, ladies who attend a GNO receive a whole lot of new information in a very short period of time. Once your facilitator sees that you are consistently safe with your gun handling, it’s her job to be available to answer questions and offer pointers to keep you safe. Your facilitator is a fantastic resource, but making the commitment to develop skills requires that you take three simple steps. A dozen ladies from the Austin, New Braunfels, and San Antonio Chapters of A Girl & A Gun came together in south Texas at Lone Star Handgun to attempt to accomplish the prestigious Rifleman badge with Project Appleseed in a Ladyseed two-day class. Project Appleseed assembled a fantastic group of mentors that included a shoot boss, multiple line bosses, instructors, instructors-in-training, and Applecore volunteers, along with the Texas State Coordinator, to teach to basic skills of rifle marksmanship and the rifleman’s role in the United States’ independence from England. Shooting is an expensive hobby and it can break the bank to buy guns, gear, ammo, and more. As you’re looking for places to cut corners, don’t skimp on a training budget. Even if you’re tempted to solicit firearms instructors to let you audit their classes, here are five reasons you don’t want free training.